Following on Calculated Risk’s post on construction employment and the housing bubble. 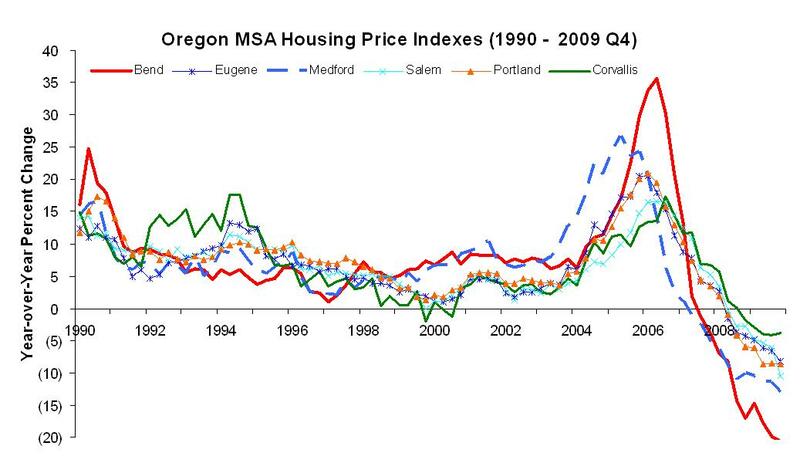 We take a quick look at how Oregon’s metropolitan areas fared since 2001. 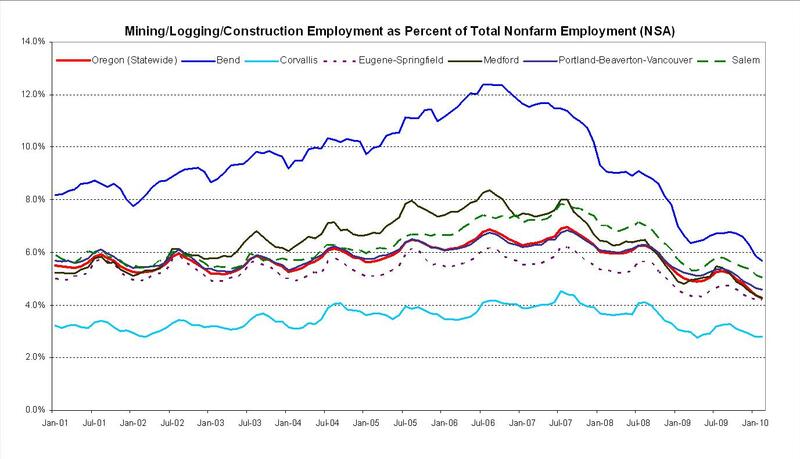 The graph below illustrates mining, logging and construction employment as a percentage of total nonfarm employment in each jurisdiction. Similar to the nation, Oregon’s cities that experienced the largest run-up in housing prices (Bend and Medford) likewise saw their percentage of employment in the mining, logging and construction industries increase during the bubble years. Over the course of the past two-three years, the percentage of employment in these industries has fallen for all Oregon cities, with Bend, Medford and Salem experiencing larger declines than the other metro areas. The second graph shows the year-over-year percentage change in housing price indexes for Oregon’s metro areas, as calculated by the Federal Housing Finance Agency. All cities have seen steep home price declines since at least mid-2008 with Bend and Medford experiencing the largest declines. Conversely, Corvallis saw the smallest run-up in home prices and smallest decline.